Bentley University has incorporated SAP into its curriculum since 1998 -- both at the graduate and undergraduate level. Bentley University has incorporated SAP into its curriculum since 1998 -- both at the graduate and undergraduate level. The college is based in Waltham, Mass., about a half an hour west of Boston, and has about 5,500 graduate and undergraduate students. The goal is not only to get students used to a system they’re very likely to use at their jobs, but it’s also to prompt the students to see connections in the way a business actually runs -- from accounting, to finance, to marketing. They learn a business process-oriented view of SAP. Several professors in the Information and Process Management in the Department of Accountancy use SAP in their courses. Jane Fedorowicz’s Enterprise Systems Configuration and Planning class is working on configuring SAP for a small company, an energy bar company. It’ll help prepare them for enterprise software implementation and evaluation processes as consultants, business systems analysts, subject matter experts or auditors. The course is offered at the graduate and undergraduate levels. The students work off SAP instances housed at the University of Milwaukee and accessed with a log-in and password for free. They work off the most recent version -- ECC 6.0, Enhancement Package 4 -- and a database that is already populated with what they need for their work. 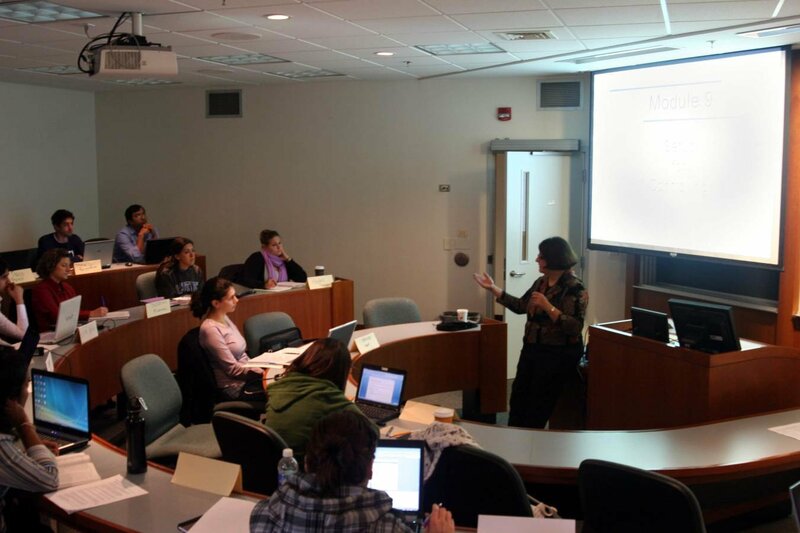 In one recent class, the students discussed the reasons behind a failed ERP implementation. They moved on to a video that showed SAP’s role in each step of the order and fulfillment process at a medical device manufacturer. They’ll spend the remainder of the 15-week course discussing ERP selection and implementation, selection criteria, requirements documentation, implementation options, testing, data quality and data governance. The SAP University Alliances program has been invaluable in developing SAP curriculum for their courses, Fedorowicz said. Jane Fedorowicz explains the FI module to her ERP Systems Configuration and Planning Class. Photo by News Director Barney Beal.